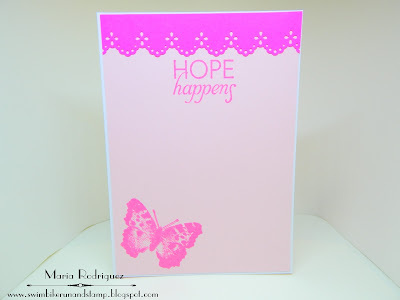 Hello everyone: The new challenge over at SHOPPING OUR STASH is all about the color PINK so, here is my inspiration card, I don't think I've ever made a card this pink before, except for some invitations.....I'll explain, hope you like it. I don't usually buy this very pink card stock but I had some in my pink stash that was left over from some Birthday Invitation cards I made for one of my youngest daughter's sister in law's granddaughter, (sheeesh!! that's a mouthful, eh?) she was going to turn 9, if I remember correctly. This little girl LOVES PINK and all things girly, so I went and bought a few pieces of this very bright pink card stock and made 30 invitations, very cute, if I say so myself. I had some left over pieces which came in really handy for this card. The images are from an Altenew set called Persian Motifs. I stamped this images onto Vellum with Versamark ink and heat embossed them with WOW pearlescent embossing powder and colored them with Prismacolor pencils then, fussy cut them and adhered them with glue dots to the panel, the Butterflies are from SU retired set Papillon Potpourri, stamped and colored in the same way. 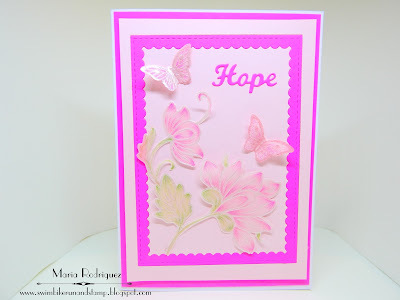 The word "Hope" is die cut with an Elizabeth Craft Designs. The sentiment is from an old Flourishes set called "Magnolias", the butterfly is from an unknown set I had for years and years. So, are you in a PINK MODE now? I hope so, my teammates and I can't wait to see what you create, there are tons of occasions that will fit this challenge beautifully. For more inspiration, hop over the SHOPPING OUR STASH blog and check out the rest of the Design Team's creations, you will be happy you did. Yes just what Lauren said, you win the prize for the pinkest pink, awesome card. It always seems brighter than it really is but it's a gorgeous card!!! Yessss that is a VERY pink card!! I love pink ! Pink has such a warm and cozy feeling to it !1 Your card captures the Princess Pink feeling for Girlie Girls ! LOVE IT !! Almost electric pink . 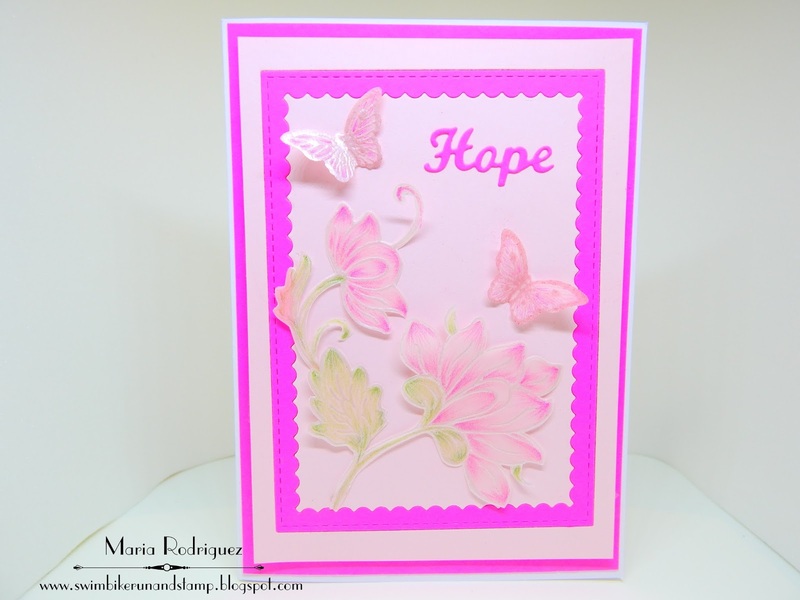 . . love the power of pink on your card, inside and out! Oh yeah, that's some bright pink, alright! You did an excellent job softening it by adding those delicate flowers and butterflies and tying in the color. Way to go!